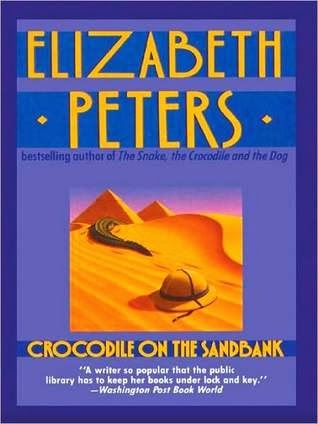 Amelia Peabody has spent her life taking care of her scholarly father and keeping house for him, and incidentally quietly mastering several foreign languages and a considerable body of ancient history and Middle Eastern archaeology. She's in her mid-thirties when he dies, and outrages her brothers (all older, independent, and successful) by leaving her his entire, unexpectedly large, fortune. Amelia may be plain, and past the usual age of marriage in Victorian England, but she is now free to pursue her own interests with no restraint from anyone. So, of course, she heads off to Egypt to visit the major archaeological sites. Along the way, in Italy, she rescues a young woman, Evelyn Forbes, a girl who has been cut off by her wealthy grandfather because she ran off with an Italian, Alberto, who seduced her, and been abandoned in Rome by Alberto because her grandfather disinherited her. Hiring Evelyn as her traveling companion, Amelia continues on to Cairo. And in Cairo, some very odd things start to happen. Alberto has followed them, and wants to win Evelyn back. Evelyn's cousin Lucas, heir to their grandfather's earldom but not to his wealth until Evelyn was disinherited, also arrives on the scene and wants to marry her. Evelyn doesn't want either of them. Meanwhile, they have met the Emerson brothers, Radcliffe and Walter. Walter and Evelyn charm and delight each other; Amelia and Radcliffe clash energetically. The Emersons are archaeologists, headed off to the site Radcliffe Emerson has obtained a license to excavate. Amelia and Evelyn hire a luxurious riverboat to sail up the Nile visiting the notable sites--with Amelia forming a private plan of stopping to see the Emerson brothers, in the hopes of promoting the attraction between Evelyn and Walter. The Emersons and the ladies are having more fun than Radcliffe and Amelia will ever admit, when the apparent reanimation of a mummy with seemingly murderous intentions derails their plans and sends them scrambling to keep any work crew at all, and identify and thwart the "mummy." Amelia is a delightfully eccentric late Victorian lady, proper and outrageous in equal parts. She might be happier in late 20th century England or America, but she's decidedly a creature of her own time, not ours. Radcliffe Emerson is irascible, brilliant, temperamental, and despite being loathe to admit it, thrilled to meet a woman as smart and as stubborn as he is. This is the first book of a long and popular series. Peters herself is just beginning to get acquainted with her characters at this point; they're more simply and broadly drawn than they will be later on as the series develops. The roots are all here, though, and while the mystery isn't very deep, it is well handled.